Have you ever sat still long enough to watch a sloth climb down a tree? Or meander over to the nearest hibiscus flower for a gentle nibble? 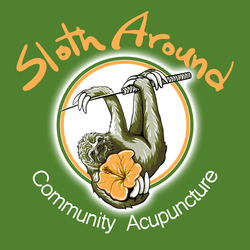 At Sloth Around Community Acupuncture, we do not believe that sloths are lazy, we think that they are intentional. Their pace of life allows for them to be fully present in the here and now, where life is actually happening. We believe that we all have something that we can learn from the sloth: how to slow down and be present, how to live life on life’s terms, and the profound strength that exists in awakening to the normal everyday moments of life. We invite you to explore these concepts of healing and more at our new clinic, where we all can sloth around together! No, we do not take insurance. However, we do provide a form that you can use to submit to your insurance for possible reimbursement. Yes, we accept cash, checks, and major credit cards. The clinic is located on the basement level. There are 8 steps down to the entryway. Please follow the signs and well-lit path straight to the door. If you require mobility assistance, please contact us ahead of time so that we can best accommodate you. Yes, there are four spaces directly in front of the clinic and additional free street parking in the neighborhood. We ask that you park as conscientiously as possible in front of the clinic to allow others room to park as well. There are a variety of sensations that are commonly felt during an acupuncture treatment. These include a dull ache around the needle, a sense of heaviness, tingling, warmth, or a sensation of something moving. Sometimes these sensations can be very strong, and most people enjoy them. That being said, they should never cause pain or keep you from relaxing during your treatment. If anything is too strong or uncomfortable, let your acupuncturist know and we can easily adjust it. We apply one-time use, sterile, disposable needles, and they're TINY! While there are many sensations that people report during the treatment, common ones include a sensation of movement in the body, waves of tingling, a feeling of heaviness, feeling like you're floating, a feeling of connection and sense of well-being. Some folks report no sensations at all. Either way, don't worry, you are still receiving the benefits. Some people just close their eyes and relax during their treatment, and it’s very common to fall asleep. In fact, we encourage taking an acu-nap if it suits you! It's fun! Just lie back, and enjoy. How often will I need to visit? Acupuncture is a process. It is very rare for any acupuncturist to be able to resolve a problem with one treatment. The number of treatments you will need can depend on many factors. On your first visit, your acupuncturist will suggest a course of treatment. This can range from "we'd like to see you once a week for the next six weeks" to "we'd like to see you every day for the next three days." This suggestion is based on our experience in treating different conditions. Generally most people notice an improvement within 4-6 visits and a typical course of treatment for an uncomplicated problem is 6-12 visits. However, if you don't come in often enough or long enough, acupuncture probably won't work for you. The purpose of our sliding scale is to help you make that commitment. Click here for more information. The amount of time you sit with the needles is completely up to you. Ideally, at least 30-45 minutes. Many people, especially those that fall asleep during treatments, report waking up and simply feeling like they’re “done.” This can vary from 30 minutes to 2 hours. We can also wake you up if there’s a certain time you need to leave. For most people, appointments end up taking about an hour, with a few extra minutes on the first visit. If I don’t fall asleep, is the treatment still working? Yes, the treatments will still work whether you fall asleep or not. If I’m coming in for back pain, why aren’t you putting any needles in my back? Acupuncture works by using meridians, or channels, that travel through your entire body. If you have back pain on your channel, we’ll likely use acupuncture points on your feet that are at the end of the same channel. We can also treat your back pain using microsystems in your ears and hands, balancing methods using other channels, and the list goes on. I’m not feeling well today, should I still come in for a treatment? Most likely, yes. If you have a very high fever and are vomiting, it might not be the best time to come in. But if you’re coming down with a cold or just not feeling well, it’s probably a great time to come in. Acupuncture can help reduce the duration of your cold, or stop it from progressing further. Last appointment begins one hour before closing.